New York, NY… Oleg Frish has just released his American Standards album “Duets With My American Idols” and celebrated with a record release party at the Russian Consulate in New York City. 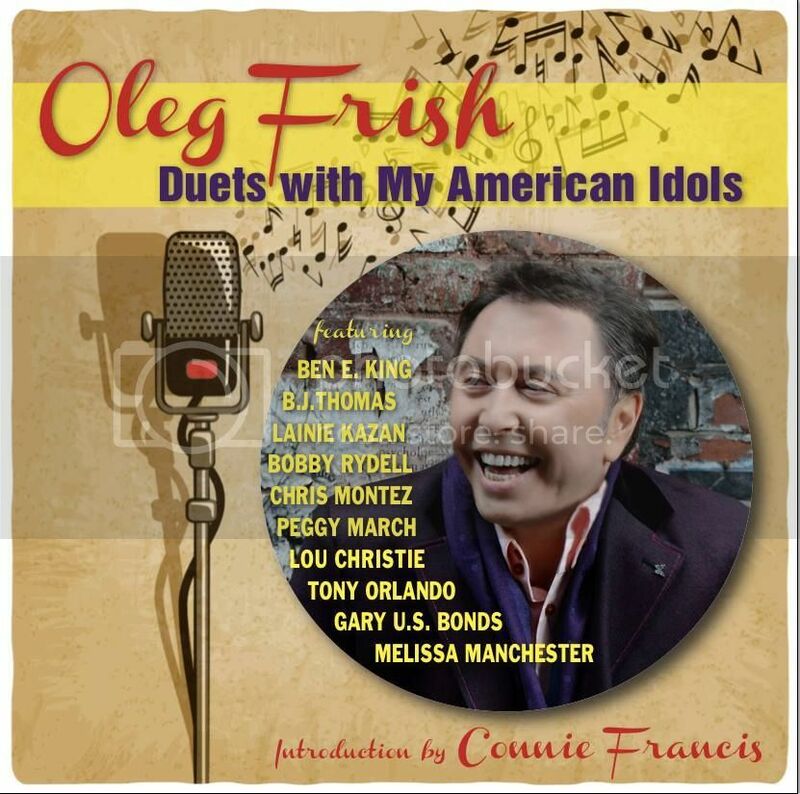 The album features duets with some of Oleg’s favorite classic singers covering legendary standards songs. The 15-track labor of love begins with an introduction by Connie Francis followed by duets with Ben E. King, B. J. Thomas, Lainie Kazan, Bobby Rydell, Chris Montez, Peggy March, Lou Christie, Tony Orlando, Gary U. S. Bonds, and Melissa Manchester. “Duets With My American Idols” is available on iTunes at: http://bit.ly/iTunes-Duets-American-Idols and Amazon at: http://bit.ly/Amazon-Duets-American-Idols. Live in-studio performances are available for viewing on Youtube; including Oleg’s duets with Lou Christie at: http://bit.ly/Smiling-YouTube, Gary U.S. Bonds at: http://bit.ly/OF-Somebody-Loves-You, and the late Ben E. King at: http://bit.ly/OF-BenEKing. Bobby Rydell, Lou Christie and Gary U.S. Bonds each performed live with Oleg at the party accompanied by Glen Drews on trumpet and Birch Johnson on trombone. Some notable figures in attendance were Rita Cosby from CBS Inside Edition, Curtis Sliwa the founder and CEO of the Guardian Angels, Chip White from WABC-TV, iconic jazz singer Helen Merrill, and the producer of “Duets With My American Idols” Allan Schwartzberg. Oleg Frish grew up in the Soviet Union, which had its American culture challenges. American music was a Cold War persona-non-grata, but yet; hit classics like “Volare”, “Hello Dolly”, and “Sunny” permeated the Iron Curtain. These songs fostered Oleg’s love for contemporary American hits ranging from ‘40s swing to pop rock from the ‘60s. That love is the origin of “Duets With My American Idols”; it is a dream come true. “Hearing hit music in USSR back in the day was tricky. There was only one record company, Melody that promoted American music. You could buy records at retail but they were being sold illegally. I would read magazines, listen to ‘flex-discs’ – you know they were sometimes inserted in the pages of magazines. It’s kind of a mission; I love those songs but without airplay and new recorded renditions, they could be lost,” Oleg remarked. At the beginning of his career, Oleg hosted a psychic show in the USSR wherein he guessed what tunes the audience members were thinking of and then sang it to them. This then led to Oleg hosting a variety on music programs for Soviet Radio and TV. After that, he came to the United States and began hosting radio and television programs on the first Russian language TV/Radio station- WMNB. Oleg started his own celebrity news program on TV and Radio called “Time Out” featuring legendary American and European celebrities such as James Brown, B.B. King, Connie Francis, Engelbert Humperdinck, Paul Anka, Al Martino, Jack Jones, John Kander, Jerry Herman, Marvin Hamlisch, Petula Clark, Michel Legrand, Yma Sumak, Gloria Gaynor, Donna Summer, Brenda Lee, Vikki Carr, Keely Smith to name a few. For more information on Oleg Frish, visit his Facebook at: http://bit.ly/Facebook-Oleg-Frish and YouTube at: http://bit.ly/OF-Youtube. You can also check out his official website www.OlegFrish.com. For Press Inquiries, contact: Gale Rosenberg at Web ‘n Retail. Email: webnretail@cs.com. Phone: 1.818.453.8777.